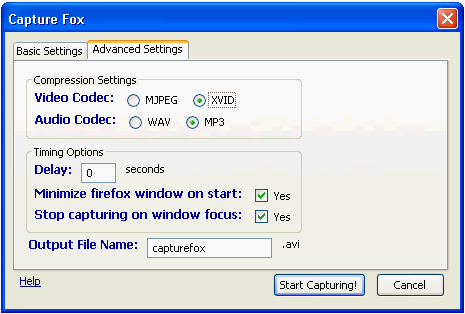 I’ve earlier shared Fireshot Firefox addon that can turn Firefox Internet browser into a full fledge screen capture app, with simple image editing features.Today I share Capture Fox, a Firefox addon that can turn Firefox into a video recorder, making it easy to make screencasts. It can record your screen frame by frame, also has audio recording as AVI files.It can record everything on your computer screen not only your Firefox Browser screen.FPS can also be adjusted with a range of (1-5).After installation capturefox can be accessed from the browser status bar, where also the elapsed recording time is also shown. This addon makes it easy to carry a screen caste app along with you on your USB Drive while using a portable version of Firefox, instead of carrying an extra video recorder app for making screencaste.The addon currently supports only Windows OS. Direct upload to video sharing sites can a handy feature, for many video uploaders.Some of the other features in the making are Shortcut keys, MP3 compression, and FLV (flash video) encoding.